Customizable status report templates are provided freely for users to represent their own status reports. 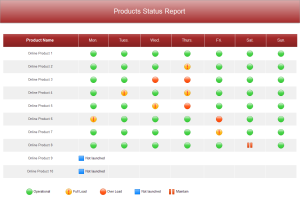 Create visual status report with ready-made templates. 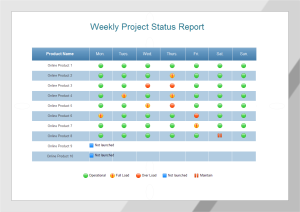 This status report template can be used for weekly or monthly status report, showing the progress of each task assigned in the whole project. 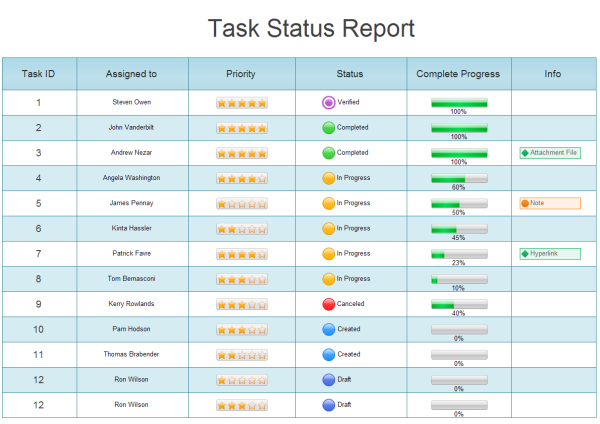 By combining the task priority, status, and complete progress, stakeholders receive a comprehensive view of the project all on one status report. If you need to add some detailed information, it's allowed to put attachment, note or hyperlink in the Info column. This template is perfect as a presentation slide in the stakeholder update meeting. All the templates are designed for general use. If you need further personalization, only a few more clicks to do. Visit the link to learn how to create great status table with Edraw. The priority bar, status button and progress bar all have smart behaviors, you can easily set the status with one click on the action button. 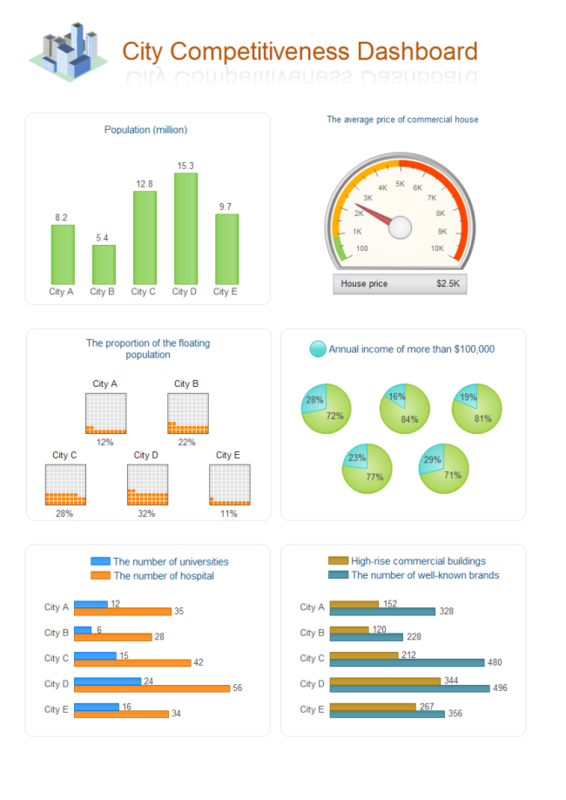 This graphics-based status report displays data on shapes in a visual way. It associates bar chart, gauges chart, column chart, and comparison indicators together in one diagram, very practical for business presentation, web post, and newspaper. 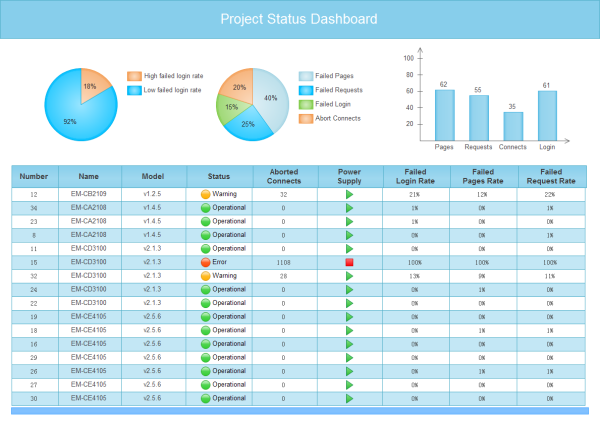 Edraw status report software helps you develop visual status reports of your management details and improving your management efficiency and effectiveness. As for people already accustomed with other Microsoft apps such as Word or Excel, the interface will be quite familiar. Simply drag and drop symbols, apply built-in design themes, and automatically share your finished status report into a presentation or PDF with one click. As an all-in-one diagramming tool, it's easy to add pie chart, column chart, line chart, gauges chart, comparison chart, and many diagrams in your status report. Here are more status report templates allowing users to choose and use. You can download these templates and modify them to meet your requirements. Download a free trial and see first-hand how quickly and easily you can create great-looking status reports.